Once again, the Los Angeles Dodgers had to bundle up their bubble machine and their Mickey Mouse ears for the winter. 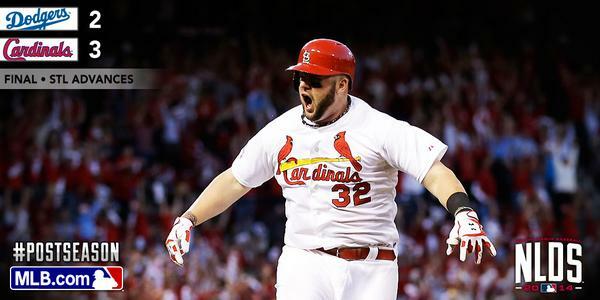 The Cardinals sent them packing with still another dramatic blast, Matt Adams' three-run homer in the bottom of the seventh inning against Dodgers ace Clayton Kershaw. They beat the Dodgers 3-2 and won the National League Division Series three games to one. "Continue to fight, never know when you might land something," Cardinals manager Mike Matheny said during his postgame news conference. "That is the way we play, to the very last out," starting pitcher Shelby Miller said during his postgame news conference. "Bad deja vu all over again," Kershaw told Yahoo! Sports after the game. "They were better than us this series," Dodgers manager Don Mattingly said during his postgame news conference. "When they needed to get something done, they got it done." 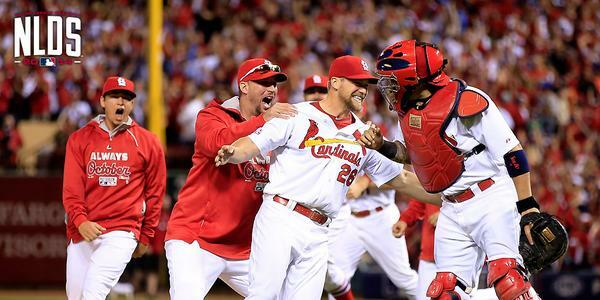 Now the Cardinals move on to the NL Championship Series while giving ace pitcher Adam Wainwright some needed rest. (His nagging elbow soreness would have made him questionable for Game 5 of the NLDS). They also have starting pitchers Lance Lynn and John Lackey positioned to pitch two games if necessary in the best-of-seven series. Not only are the Cardinals marching on, they are reminding the baseball world that they could contend for a long, long time. Kolten Wong, who made an inauspicious debut as an extra guy in the 2013 postseason, was one of the heroes this time around. His long homer decided Game 3. Miller earned the No. 4 rotation slot after last season's bullpen relegation. He did a solid job in this clinching game, allowing two runs in 5 2/3 innings. "He just had a 'I told you so moment," Matheny said. Pitcher Marco Gonzales, a 2013 draft pick who started the year in the rotation at Class A Palm Beach, settled into a key relief role from the left side of the bullpen. He helped bridge the Cardinals to their late inning guys again today, earning his second relief victory. Rookie outfielder Randal Grichuk became a line-up staple against the left-leaning Dodgers pitching staff. He surprised Kershaw with a solo homer in Game 1 and later drew a critical walk in the eight-run uprising. Outfielder Jon Jay also stood tall, putting his previous postseason hitting frustrations behind him. Then there is the maturity factor. Matt Carpenter tore into the Dodgers, proving he belongs in the team nucleus for the long haul. His time has come. Adams battled through his late-season slump, his lingering side muscle soreness and his season-long struggle versus lefties to deliver key hits -- including the dramatic Game 4 winner. "I got a curve ball up in the zone," he said. "I saw it pop up out of his hand and thought it might be a good one to hit. Outfielder Jon Jay also stood tall, putting his previous postseason frustrations behind him. Add it up and the rest of the country has plenty of reason to dislike this team. The good citizens of Cardinal Nation are probably OK with that. The Cardinals came back from deficits of five runs and two runs to beat the best pitcher in the world twice. They deserve this series. Since Albert Pujols left for the Angels, the Cardinals have won 19 postseason games, Angels haven't won 1 playoff game. Cardinals first team to reach four straight LCS since 1998-01 Yankees. 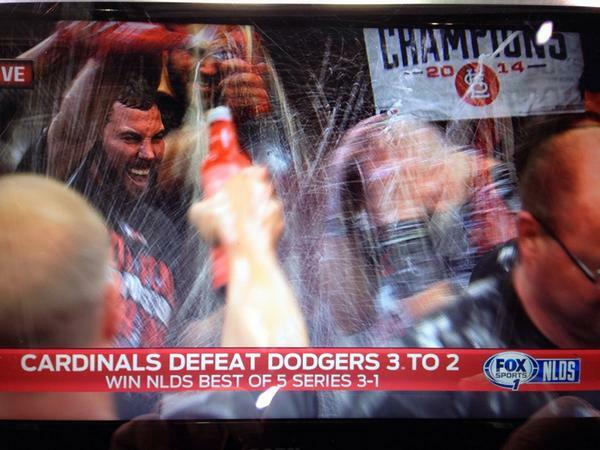 That's nine NLCS in 15 years for STL. They still wear jerseys with two little tweety birds on them. No number of championships can overcome that. But really, thank goodness we get to see the Cards in the NLCS. Maybe the Giants too? It'd be novel! The first three teams out of the postseason are the Dodgers, Angels and Tigers. Combined payrolls: $552M. The teams that beat them: $310M. Your best bat out of the lineup. He has a hurt ankle, but you pinch run him. Never use your best reliever. Just go away, Donnie Baseball. Dodgers flight home will still layover in Phoenix for a ceremonial dip in the Diamondbacks pool.